Could there, or could there be not a stable toroidal planet? Before I start trying to answer this question, I must accent that I would probably never come with this idea myself. The question was, in fact, raised during solving of a miniproject "Describe Any Fictional Universe and Tell Something Interesting About Its Physics" on scientific camp of correspondence seminar M&M. So authoresses are, in fact, Martina B., Alča B. and Míša K. - I only helped them to resolve some technical details. But later on, I was so much drawn-in by the idea of toroidal planet, I couldn't stop until I calculated the details a bit deeper that was possible on M&M. It wouldn't be very wise to try to calculate the result analytically, for just a potential field of massive circle requires working with elliptic integral functions - whole toroid is unlikely to be more simple that that, probably completely out of reach. Let us approximate the toroidal planet by set of massive points instead. I was very surprised by the fact that a mere ring of massive points gives a qualitatively good result. However, for better precision, we will use set of circles of massive points and decompose the planet into such slices, as shown on Fig. 1. The planet is hardly a rigid body on the planetary scale of sizes - it would be much closer to truth imagining it's out of water! The mass of the planet always fills the inside of the surface of constant potential. Therefore, after first calculation of newtonian potential V(r), we take a surface V(r) = const., we fill it by mass by changing the positions of massive points accordingly and repeat the calculation. I performed this for a torus of R = 3 r proposed by original authoresses. Fig. 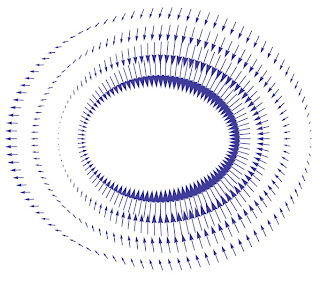 1 - massive points used as an approximation of self-gravitating torus. It is immediately clear that inner radius of the toroid has always smaller potential than the outer one and that the mass will flow to the center eventually forming a sphere after some time. The only way out of this trouble is to suppose that the planet rotates at high pace, so the centrifugal force is pulling the mass out of the center. We introduce potential of the centrifugal force v(r) = -1/2 ω2r2 and we choose the angular velocity ω to be of such value that points on inner and outer radius will have the same potential. In combined gravitational and centrifugal potential, equipotentials indeed converge to oblate toroid. It is not a circle that rotates about the axis of symmetry, but an ellipse is a very good approximation. It seems from the performed numerical experiments that it is not a metastable equillibrium. If we increase angular velocity a bit, toroid will became more oblate and of higher main radius, but remains stable. Fig. 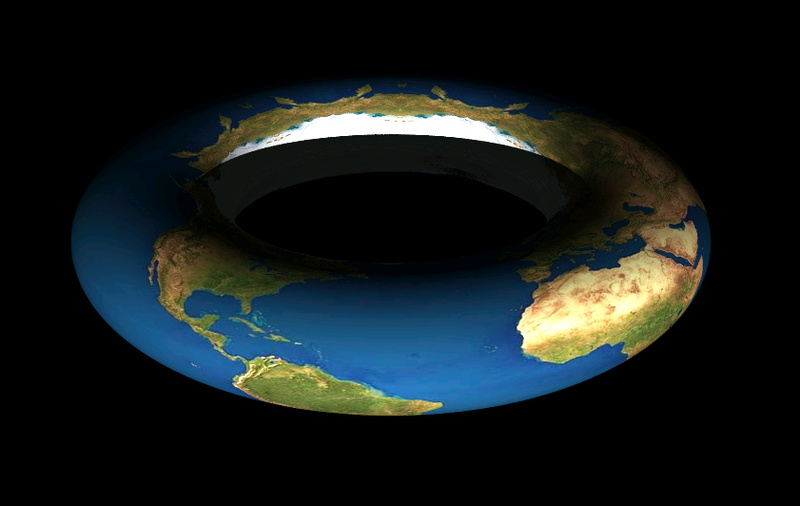 2 - gravity field of the toroidal planet. The right side of the picture belongs to the inner side of the torus, the left is outer. When we have a stable toroidal planet, we can harvest the fruit of our work and calculate some interesting properties of the planet. We will start with gravitational force, which is simply a gradient of the potential. You can see resulting field on Fig 2. It always points to the surface, so there is no lateral pull, but its magnitude changes according to observer's position. If we choose the major axis of rotating ellipse to be the Earth's radius and density 5500 kg/m3, it varies from 3.64 m s-2 for the outer radius, to 9.78 m s-2 on the inner radius. 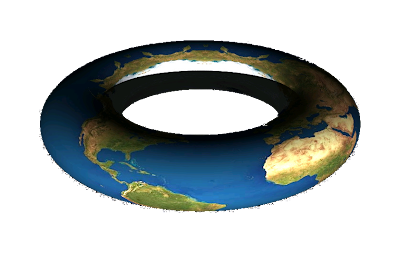 For the last image of this article, I used our planet Earth changed into toroidal shape, but it would be very naive to think climatic conditions would be preserved. First major change (not mentioning the changing gravity) is a length of days nights. If we put a sun very close to the plane of rotation (inclination to the ecliptic 6°), we can see from the Fig. 3., that in the region of former Earth equator (torus' "outer equator"), the days and nights would look very similarly to that we know from Earth. Only the day length would be changed to 2.6 hours instead of slow 24 hours days of Earth. As we go to the "north", e.g. to Europe, we soon reach area, where the light intensity is the same all the time, so there is almost no change of day and night at all! (The sun appears to be always near horizon spinning around at high pace.) Going yet further to the north, we get to area, where is constant night during "winter" (we are in shadow of the rest of torus), but during "summer" the day and night cycle would look exactly like near equator. The angle between sun rays and the surface normal is almost 0° and sun is almost at nadir at noon, making the days very hot. There is also an area, where sun never shines. This, of course, depends very wildly on the inclination of the axis - if it was bigger, both inner and outer equators would be illuminated by the same way in both "summer" and "winter" - the shadow of torus would not shade the inner radius. During "spring" and "autumn", the inner radius would be always shadowed. Of course, to investigate where will be rich vegetation and where deserts, or how would the global circulation of atmosphere look like, one would have to run pretty sophisticated climatic model. This is, unfortunately, beyond my time possibilities - it would be serious work for few years to do that properly. :-) (Unless you are a climatologist with rich experience with already present global models of climate, of course..) However, we may try to guess some things. One of basic principles according to which the air flow establishes in the atmosphere is transfer of heat. On Earth, most of heat is produced around equator. Hot air raises to upper atmosphere, where it starts flowing to the north, where it eventualy turns downwards. This convection cell is called Hadley cell and there is not only one - in fact, there are three major ones. Places where hot air raises up are characteristic by rich precipitation and the land is usually covered by vegetation there (rain forests and temperate forests), the other end of the cell is usually arid and major deserts forms in these places. Fig. 3 - daylight in "spring" (left) and "summer" (right). From spherical planets we know that the magnitude of precession of their rotational axes is very small. It would be natural to think it is because of their spherical symmetry - all the principal moments of inertia are almost the same. For torus, however, one might expect a typical precession to be much larger. It would be, indeed, true if the torus would be a rigid body. However, as we said in the beginning, on planetary scales the mass behaves much more like a liquid than solid. It is therefore probable that if there was some initial precession, it would be reduced by the tidal forces. By other words, either the torus would eventually form around the principal axes of inertia and resulting precession would be small, or it would be torn apart by them. Another interesting physical question is whether there are stable orbits around the planet. I also investigated this and it seems from the numerical simulations, that there are stable distant orbits, which are elliptical (as expected), with some perturbations caused by non-spherical shape of the central body. All orbits in the vicinity of the planet (like those, which would go through the center of the torus) are in principle possible, but unstable, maybe except of pendulum-like periodical movement up and down through the hole inside the torus. If we imagine a Earth-like biosphere on the torus, probably the most interesting question is, how would the sleep cycles of the animals be affected. (Provided the sleep is univerzal feature of complex neural networks, which is not necessarily true.) From experiences with planet Earth, we somehow relate sleep with day-night cycle. But if the days were too short, it might be more preferable to completely ignore them and evolve sleep not directly connected from day-night cycles. However, if you take for example giraffes, which sleep only 2 hours a day, we might deduce that sleeping during night lasting 2 hours is possible even for animals with brains developed in circumstances of 24-hour rotation of the Earth. At the very end, I put here some physical properties of the torus. Enjoy!